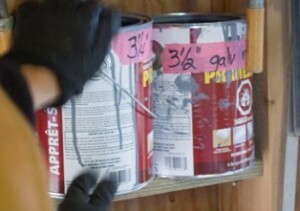 Every seasoned homeowner has stacks of half full paint cans lying around. If you do ever end up emptying a few of these, you can repurpose them into great hardware organizers. Old paint buckets are the perfect size for storing the sort of small hardware you buy by the handful – nails, screws, wire couplers, even hinges. Just watch out for pointy ends when you jam your hands in there. 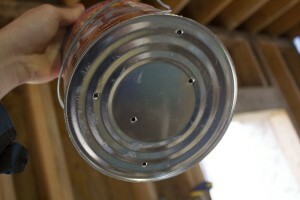 Every can gets neatly labeled with thick painter’s tape so we know at a glance what’s where. The convenient carrying handle means you can cart several around at once. And you can fit 2 perfectly inside a standard stud gap, making them easy to set up out of the way when working on a building project or in the shop. 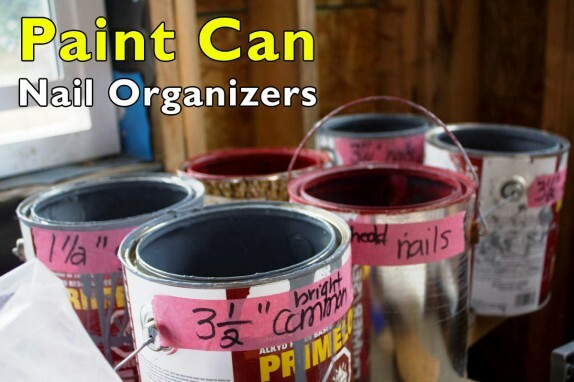 It’s up to you whether or not to clean your paint cans out before you set them to their new future as hardware storage containers. Water or latex based paints are the easiest to clean out. Oil based paints are much more laborious but many paint manufacturers are phasing oil based paints out in favor of latex. Instead of washing out old oil paint cans, we just scrape out as much paint as we can and let them dry for a long time before using them. We like to bore holes in the bottom of our old paint cans just in case one of us carelessly leaves one of these outside during an unexpected weather event. For the same reason we try to keep all the lids too, which come in handy inside the workshop so sawdust doesn’t find its way inside.